Residents and business owners around Concord, California have noticed cracking and pitting in concrete that the original installer told them would last a lifetime. No concrete slab can last forever in the Bay Area climate, but certain techniques hold up longer than others. Instead of demolishing sidewalks and replacing driveways with sod, repair your concrete surfaces and give your property a cost-effective makeover at the same time. Sierra Concrete Resurfacing, an acclaimed decorative concrete contractor for the East Bay, has dedicated 30 years to repairing, refinishing and resurfacing local floors, patios, pool decks and walkways. Experienced work crews can handle any commercial or residential project, from simple patches to complicated, mosaic overlays. The company is now accepting new customers around Concord, Walnut Creek and Pacheco. Contact the scheduling hotline at 916-631-9666. Concrete repairs and resurfacing: Corporations, restaurants and retailers depend on Sierra Concrete Resurfacing for high-traffic flooring, slip-resistant pathways and decorative remodels. Concord homeowners turn to this concrete contractor to patch front porches, level warped basements, stain back patios and refurbish ugly driveways. Each property, whether it is a condo in an older neighborhood or a luxury estate near the Lime Ridge Open Space, deserves a fresh, well-designed facade. Concrete coloring: Instantly transform your unappealing gray slabs into works of art. After you select a color and style, technicians strip your existing floors and get to work. Imagine the compliments you would receive about red leather texturing on your guest bathroom floor? Would you like to add rich oak shades to your entryway, or would you prefer the subtlety of a light river stone? Concrete staining options are virtually endless, which is why this technique is so popular in San Francisco housing, retail and office units. Stamped concrete overlays: Would you like to set yourself apart from the other 122,000 people around Mount Diablo? Give any flat surface, including driveways, walkways and patios, some modern depth and character. Installers craft a concrete topcoat that resembles real slate, limestone, brick or oak without messy demolition or expensive materials. Exterior textures: Concord averages precipitation at least one full day each week, which equates to plenty of problems for exterior concrete. Add moisture from pools and foot traffic from garden paths and you have the recipe for flaking, discoloration and general unattractiveness. If your patio or pool decking could use a refresh, consider Sundek Classic Texture. This coating reduces slipperiness and makes 90-degree temperatures more bearable on your feet. You can even customize the color and pattern with stains and overlays. Sierra Concrete Resurfacing proudly operates as Contra Costa County’s only Sundek provider. Heavy-duty flooring: If you would like to make your garage look as good as the rest of your home, try the secret that hospitals and malls have used for decades. Polyurea polyaspartic and epoxy floors are resilient, durable and beautiful. The seamless quartz coating repels oil and grease, hides scratches and matches any style of decor. Take a day to enjoy the concerts in Todos Santos Park and rest easily knowing that your garage will be finished by the time you return. 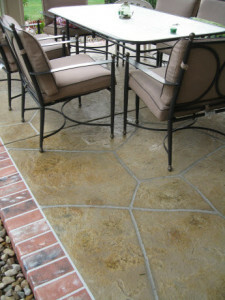 Let Sierra Concrete Resurfacing bring out the natural beauty of your home or business. If you are ready to improve your concrete floors and walkways, call 916-631-9666 for a free quote.